This is going to be a quickly written post and a lightly edited one, because if we all waited to perfect our post, we’d never write any, right? And because I promised myself I’d take a nap, and I’m due somewhere in less than an hour, so there’s not time to do both. Or is there? The kind of writing/swimming I was doing yesterday was allowing thoughts and images to flow without trying to hook them onto anything else. I allowed them to just come and go, my mind filling and releasing. I knew they’d still be there when I wanted them, and then I sat at my computer and I wrote. Truly, I’m not sure what I wrote, but I know it was important to my MC. Was it any good? I couldn’t say — I haven’t been brave enough to go back and read it. So even if you don’t think you’re writing because you take a break from your scheduled writing time, if you believe in your current work and are determined that you will give it as long as it takes and will not compromise an inch until your MC’s (Sorry, non-writers. “MC” stands, of course, for Main Character. My apologies.) story is told. Every. Last. Word. Of. It. Just as she wants it to be. P.S. 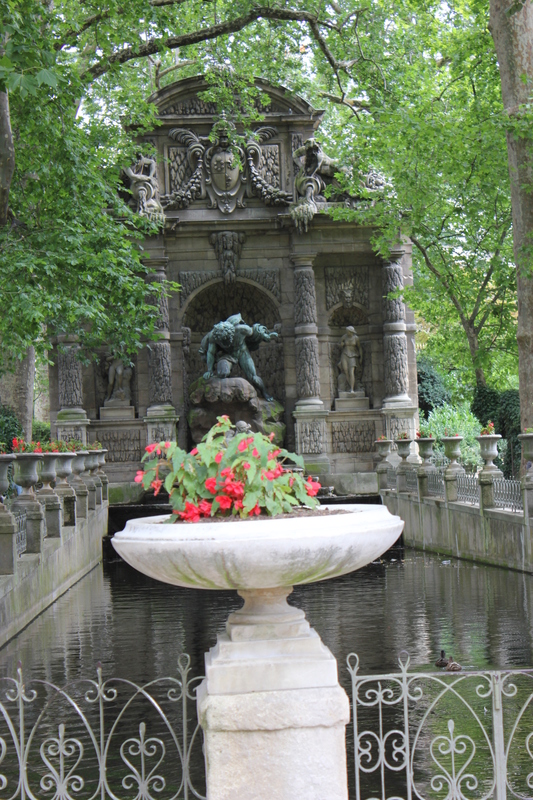 The photo is one I took of a fountain in Paris. Just because. Enjoy!